NOTE: This guide is not tested for Ubuntu, but should work the same way. The extension *.backup is arbitrary, but is the one that is expected by pgAdmin. After that the next step for me was installing Linux Mint 17. If you’re not installing/upgrading an OS, your next step might involve going straight to installing/upgrading PostgreSQL 9.5/PostGIS 2.2. If you are not yet using the ubuntugis-unstable PPA, go ahead and set that up. This will give you access to the latest PostGIS, GDAL/OGR drivers, SpatiaLite, QGIS, etc. In spite of the name, the repository is very stable and widely used. Since the PostGIS package depends on PostgreSQL, you should get everything you need. If you use pgAdmin III for server management, that has to be added separately, as I have done here. Before you can restore your database you have to have a cluster to restore it to. When you install Postgres on a Debian-based Linux distro, the installer will automatically create a database cluster named main with a data directory in /var/lib/postgresql/9.5/main. But it’s fairly common to run a server with a small root partition, and have the database cluster, which can grow very large, on a separate data partition. If you follow the PostgreSQL docs for initializing a new cluster, it will work, but your new cluster will not start at system startup, and if your database client connects to localhost:5432 the connection will go to the default cluster created during installation. WARNING: I am about to show you how to delete a database cluster. This assumes that you have done a fresh install and the main cluster created during install is empty, or that you have a backup of your database as I demonstrated at the beginning of this article. If you are attempting an upgrade (i.e., not a fresh install) but do not know whether your data is backed up, STOP and make sure that you have a backup! First, decide where you are going to store your data. PG documentation recommends not creating a cluster at the root of a partition. For example, if you want to have your cluster on a partition named /data, you should create your cluster in a folder on that partition, not as the root folder /data. In the example below, I create a cluster named pg_data. A folder of this name should not exist,* and will be created for you. The first statement will stop the default cluster and drop it (destroying all data in the process). The second statement will create the folder /pg_data in the /data partition, set the folder owner to the postgres system user, initialize the cluster, and start it. New clusters are assigned the next available port beginning with 5432. Because we have dropped the default cluster, the new cluster will be assigned port 5432. If you did not drop the default cluster, or have other clusters on this server, the new cluster will be assinged 5433 or the next available port number. Remember that port 5432 is the default PostgreSQL port. Note that the dummy clusters I have “created” above use ports 5433 and 5434, because 5432 was already taken. If you want to be able to access the database without specifying the port number, make sure to drop the default cluster first. The cluster will be initialized to use trust authentication, which means that all local users can log in without a password. The cluster will also automatically have a postgres user. It is usually good practice to create a SUPERUSER role to manage the database instead of logging in as postgres. However, we have to log in with postgres at least once to create the SUPERUSER role we will use for the rest of our database management. If you set the role name to match your Linux user (e.g. 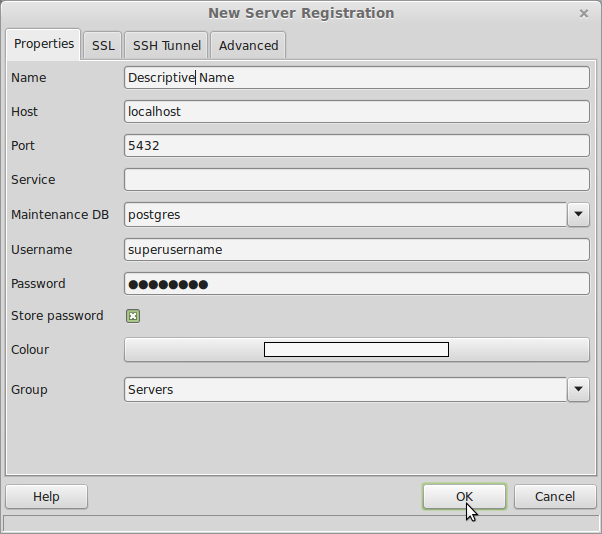 jsmith), you will be able to launch psql without specifying the username. If you also create a database named for the user, psql will automatically log in to that database. Obviously, this is probably something you don’t want to do in an enterprise setting, but can be useful for a development laptop. Close and save. Now restart the postgres service, or just reboot, so that postgres restarts using the new cluster. Only then do we load the data, which we do using a special script rather than the standard pg_restore command. Either way, you end up at a SQL editor. You are in the postgres database, which should be used only for system data, so create a new database to store your “real” data. Go get a cup of coffee. In fact, go out to dinner. Maybe see a movie. This will create a new entry in the pgAdmin Plugins menu. That’s it! You should now have a working PostGIS installation. The first thing I did was fire up QGIS, connect to the database, and load some of my old projects to make sure everything was working. Happy geoprocessing! * pg_createcluster can be used to bring an existing PostgreSQL data directory into the cluster management architecture. However, if you are doing a major upgrade of PostgreSQL or PostGIS, you need to do a dump and restore anyway. You cannot upgrade the cluster “in place”. So these instructions emphasize creation of a new, empty cluster, followed by a restore of your old database. For information on bringing an existing data PostgreSQL data directory into the cluster management architecture, please read the pg_createcluster documentation. PostgreSQL docs and various StackExchange fora including Ask Ubuntu and Database Administrators for sundry bits and pieces. When you install Postgres on a Debian-based Linux distro (in my case, Linux Mint 18), the installer will automatically create a database cluster with a data directory in /var/lib/postgresql/9.5/main. But it’s fairly common to run a server with a small root partition, and have the database cluster, which can grow very large, on a separate data partition. I didn’t have any trouble using initdb to initialize the cluster in the desired location. But at system boot, the server automatically started using the default data cluster, not the one I had created. The PostgreSQL documentation on how to customize server start was pretty obtuse. An existing cluster will be added to the list of clusters, rather than reinitialized. This was important, because I had already run a load script overnight to restore a database dumped from a prior version of Postgres/PostGIS. PostgreSQL uses the default port number 5432. New clusters will be automatically initialized to use a new port one number higher than the highest existing Postgres port (5433 for the second cluster, 5434 for the third cluster, etc.). pg_dropcluster does take --stop as an option to stop a running server, but I already had both servers stopped. The -d option to pg_createcluster is where you set the data directory for the new cluster, and the --start option start the cluster immediately after adding it to the list of available clusters. After running those commands, I confirmed I could connect to the running server. Then I rebooted to make sure the server started at boot, which it did. NOTE: Tablespaces can also be used within the database to determine where the database stores the data. The primary use case for this, however, is if the DBA wants to store data that is accessed with varying frequency on media of different speed: commonly accessed tables on fast hard drives or solid state drives, infrequently accessed tables on slow hard drives. It adds complexity to the installation, and is not really intended for the case where the DBA wants the entire database cluster on one partition, but in a nonstandard location. I wanted to map police stops under the NYPD Stop and Frisk program (official source, easier to use version from NYCLU), but at city or borough scale, this just looks like a continuous carpet of dots. Visualizing that kind of dense point data is exactly what hexbinning is for. 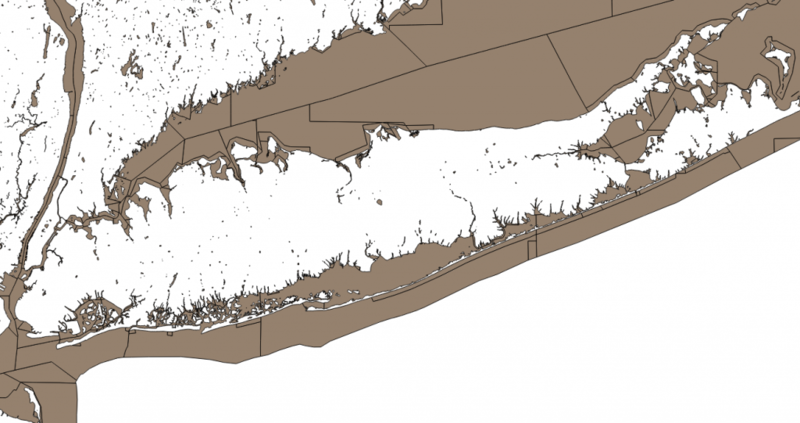 In a couple of weeks I will be presenting a workshop entitled Location Data Query with SpatiaLite and QGIS to the NYC Open Data Meetup. The workshop will describe how to do some typical GIS operations (e.g. buffering, intersecting) in spatial SQL rather than in the typical desktop GIS.